SINGAPORE, Nov. 16 (Xinhua) -- The 33rd Association of Southeast Asian Nations (ASEAN) summit and related meetings concluded on Thursday with the regional group and its partners eyeing a more integrated economy in the region and calling for safeguarding the multilateralism worldwide. 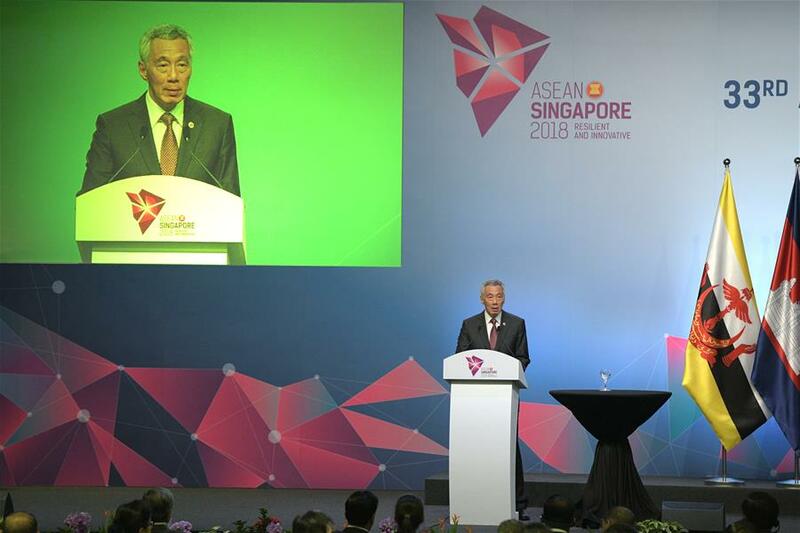 Singapore's Prime Minister Lee Hsien Loong, whose country holds the rotating ASEAN chairmanship this year, said at the closing ceremony that leaders "have been focused on ASEAN community building and strengthening our linkages with key partners," adding that strong supports from ASEAN members and its external partners helped make the shared vision of a resilient and innovative ASEAN possible. ASEAN has redoubled its economic integration efforts and demonstrated clearly its commitment to uphold a free open and rules-based multilateral order within ASEAN, said the Singaporean prime minister. ASEAN, now the sixth largest economy in the world, registered a combined GDP of 2.8 trillion U.S. dollars in 2017, a 5.3-percent growth year-on-year, up from 4.8 percent in 2016. ASEAN's total merchandise trade reached 2.57 trillion dollars last year. During the summit, ASEAN leaders forecast that the growth is expected to remain stable at 5.1 percent and 5.2 percent in 2018 and 2019 respectively. On Monday, ASEAN trade ministers signed the group's first ever agreement on e-commerce in efforts to encourage paperless trading between ASEAN's businesses and governments to generate rapid and efficient transactions and deepen cooperation to drive regional economic growth in this regard. ASEAN's internet economy is set to quadruple to 200 billion U.S. dollars by 2025 from 50 billion U.S. dollars in 2017. In another innovated move to create a more integrated ASEAN, the member states have established a smart city network, a collaborative platform where cities work together towards the sustainable urban development and and promote new business opportunities and innovation. Besides, the ASEAN leaders also hailed progress made in other economic thrusts including improving trade facilitation, deepening services and investment integration and cultivating a conducive regulatory environment for economy, according to the chairman's statement of the summit. ASEAN has developed several dialogue with regional players including China, South Korea, Japan and Russia. This year marks the 15th anniversary of the establishment of China-ASEAN strategic partnership and the two sides also marked the Year of Innovation in 2018 and adopted the Joint Statement on China-ASEAN Science, Technology and Innovation Cooperation to find more new area of cooperation. The 10-member group also signed its first medium and long-term plan with China. The China-ASEAN Strategic Partnership Vision 2030 was endorsed at a China-ASEAN summit on Wednesday to guide the future development of their strategic partnership and mutually beneficial cooperation. Lee said the plan will chart the future direction of the ASEAN-China strategic partnership, adding that the two sides share a strong, substantial and mutually beneficial relationship and bilateral economic ties are "robust." China has been ASEAN's top trade partner for continued years and the upgraded bilateral free trade agreement will open up new opportunities for businesses and further increase two-way trade. In the meantime, ASEAN also upgraded its overall relations with Russia from dialogue partnership to strategic partnership. The two sides agreed to promote peace, security, stability and prosperity in the region by further deepening of relations, mutual trust and confidence, adding that they should also enhance economic cooperation amid growing protectionism. ASEAN also held meetings with external partners of South Korea, Japan, the United States and some other nations in the Pacific and East Asian region to seek more opportunities for ASEAN and regional economic development. Multilateralism was the key word and reiterated by the ASEAN chairmanship on different occasions during the ASEAN summit and related meetings, at a time when protectionism and unilateralism are looming on the horizon. The Singaporean prime minister warned during the opening remarks of the ASEAN summit that "the international order is at a turning point. The existing free, open and rule-based multilateral system, which has underpinned ASEAN growth and stability, has come under stress." In efforts to address the uncertainty triggered by the rising trade tensions, leaders of ASEAN and its six free trade partners - China, Japan, South Korea, Australia, New Zealand and India, intend to conclude their negotiations on the Regional Comprehensive Economic Partnership (RCEP) in 2019. It will send a clear and strong signal about commitment to multilateral trade, which, according to Lee, is urgently needed amid the rising anti-globalization sentiment. Relevant leaders said that the RCEP negotiations have made substantial progress this year. A total of 24 rounds of negotiations have been held on the expected free trade bloc since the negotiations were launched at the end of 2012. RCEP, if established, will be one of the world's largest trading blocs, accounting for 45 percent of the world population, 40 percent of global trade and one third of the world's GDP. During the ASEAN plus Three summit held here Thursday, ASEAN members and its three external partners of China, South Korea and Japan, also called for multilateralism, with Lee's remarks that "we must continue to maintain an open, rule-based and inclusive global trade environment" for all members. He added the group should redouble its efforts to uphold the multilateralism so as to tackle the common challenges of growing trade tensions, digital revolution and cyber security. Thai Prime Minister Prayut Chan-o-cha renewed the call for multilateralism that ASEAN will look towards the future by strengthening partnership both within itself, with its external partners and with the international world. Thailand will be the ASEAN rotating chairmanship in 2019 and the theme of the 2019 ASEAN summit and related meetings is "advancing partnership for sustainability."